The warm, tranquil waters of the Red Sea are perfect for the growth of corals, and the masses of brilliantly colored fish that live amongst them, making Aqaba a prime attraction for snorkelers and divers. Inland is a vast desert of stark beauty that entranced Lawrence of Arabia when he headquartered in its empty canyons during WWI. Even more awe-inspiring is the ancient city of Petra, carved into dusty pink rock by the Nabateans more than 2,000 years ago. Entering through a long narrow stone passage, you’ll come suddenly upon the massive façade of the Treasury and stop dead in your tracks, mouth agape. “Wow” doesn’t begin to cover it. 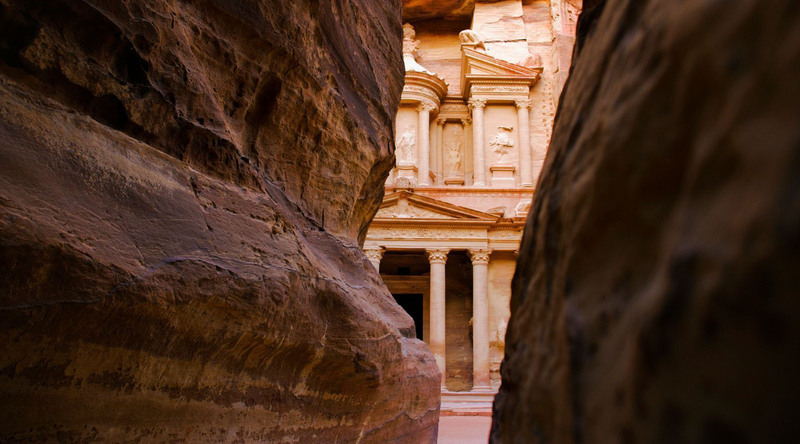 Explore the awe-inspiring city, carved into dusty pink rock by the Nabateans more than 2,000 years ago. One of the most amazing desert landscapes in Jordan, with diverse terrain, uniquely shaped mountains, and breathtaking colors. Wadi Rum has a desolate landscape that some consider similar to that of the moon’s surface. The fortress like city of Petra became an important and rich stronghold. Get a taste of Jordan’s breathtaking desert landscape on a journey to Wadi Rum, where you’ll enjoy a Bedouin-style lunch. Discover the remains of a mighty ancient city that was once lost for 1,000 years on this two-day excursion to the wonders of Petra.